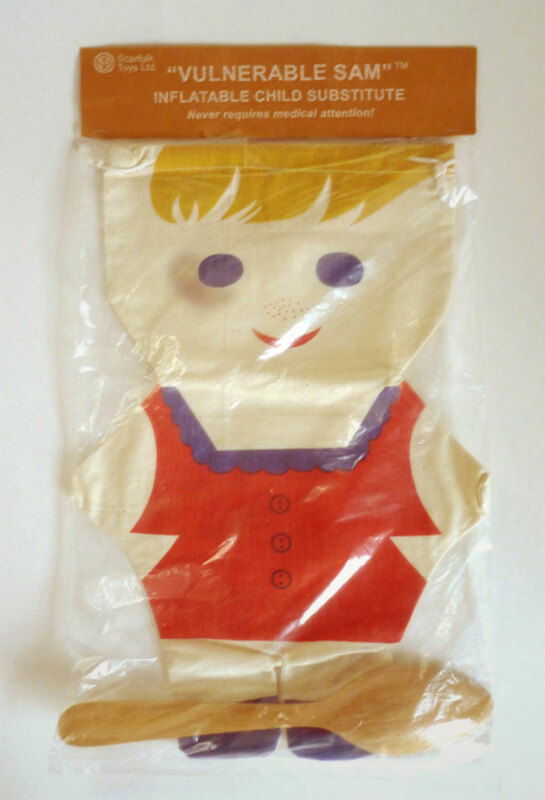 After the last post about inflatable child substitutes, a young reader has written in asking about the use of dolls in general. 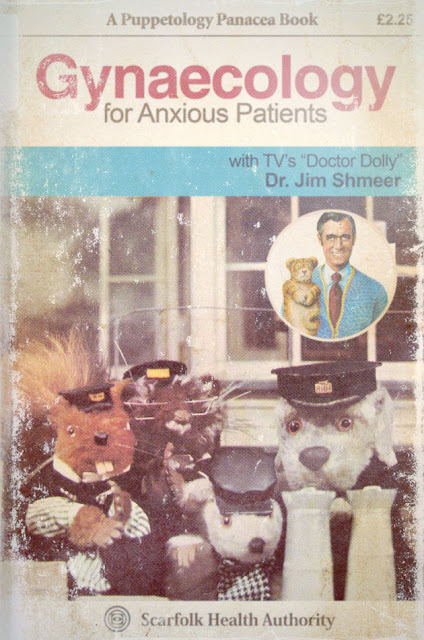 Puppets and marionettes were frequently used in 1970s healthcare. For example, at Scarfolk Hospital & Confectioners, electro-shock therapy was administered by ventriloquist dummies. Even Scarfolk Council's very own Barbara, the omphalophobic hand puppet, performed amateur lobotomies on disobedient children and undesirable tourists in her weekend hobby group. Bi-weekly prostate examinations were performed by a wooden Pinocchio puppet who initiated the procedure by telling a series of lies (whilst attached to a polygraph machine to ensure a rigorous, productive examination). *Before the advent of fibre-optic cameras the use of crickets or grasshoppers for exploratory surgery was common. However, there was a breakthrough in 1978 when a local scientist invented a miniature polaroid camera which he taught locusts to operate. This educational product went on the market in late 1972 and was targeted at prospective parents, nursery school teachers and church staff. It afforded them the opportunity to practice their corporal punishment techniques before inflicting them on an actual child. "'Vulnerable Sam' wants you to hit him (or her). Yes, that's right: Give him a good old whack! (wooden spoon provided). 'Vulnerable Sam' deserves everything you can throw at him. Hone your skills like a pro so when it comes to the real thing you can achieve the perfect balance of injury and compliance. Our research shows that correctly administered physical punishment will produce long-term psychological effects. Guaranteed. Now, that's what we call value for money! 'Vulnerable Sam' requires no medical attention and can't report you to the police or welfare services. So what are waiting for? Pick up that wooden spoon, cricket bat, or red hot poker and strike while the iron's hot! "Sam! Stop it! Only filthy animals defecate where they sleep!" " Jesus hates you, Sam. It's your fault that he was killed by Italians." "Why must you constantly remind me of my first child who died?" "You are irretrievably unaesthetic. I'm ashamed and sense the scorn of my peers." Tolerating poor people has always been a challenge to more civilised, useful members of society. Because of a historical legal statute the poor, unemployed and homeless were not formally recognised as homo sapiens until 1971. Before then they were officially categorised as a class of 'fruit or vegetable' below melon but slightly higher than turnip. Technically, this meant that they could be traded, thrown at petty criminals and fed to pigs, though this rarely occurred. The government always endeavoured to strike a balance between eliminating the poor (and thus the strain on society) and needing them to fulfill menial, demeaning work: cleaner, road sweep, theologian, etc. It was Dr. Max Gongfarmer, professor of Socially Debased Ethics, who had the idea of feeding secondhand food to the poor after reading an amateur historian's account of Marie-Antoinette's life. According to the typo-ridden book, she uttered "Let them eat cak." 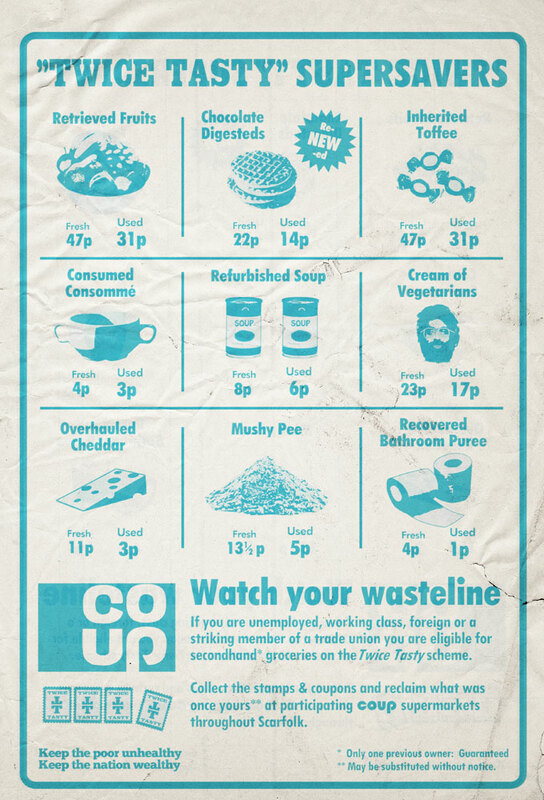 Unsurprisingly, the poor, who have no sense of aesthetics or cleanliness, welcomed the idea and it thrived in 1970s Scarfolk, as can be seen from this newspaper advertisement for the COUP supermarket chain. 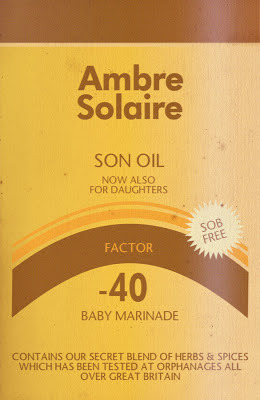 "A child's skin is vulnerable and can easily burn, which could impair the flavour. 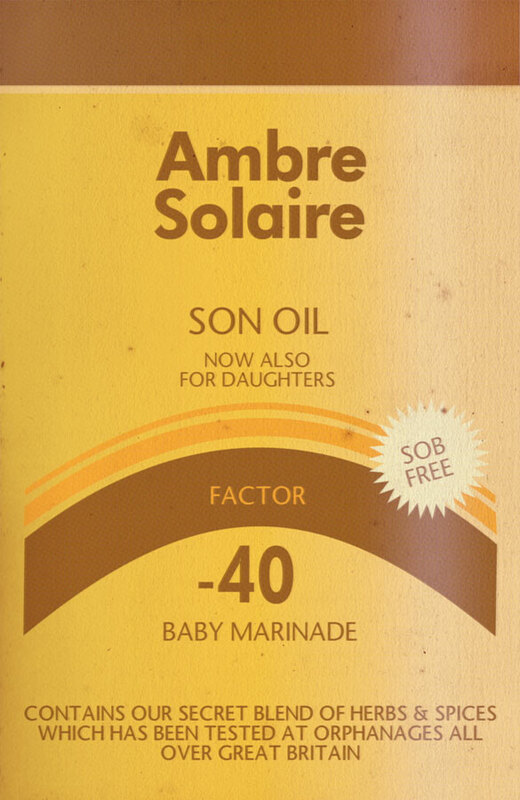 To avoid damaging the skin first blanch the child for fives minutes then generously apply Son Oil. Add salt, pepper and newts to taste, then leave the child in the garden during the hottest part of the day. Whimpering usually means that the child is ready to be transferred to the grill or oven. Warning: Illegitimate or unbaptized children burn more quickly."